The Government is rushing the HE Bill through to its Second Reading in the House of Commons. The Second Reading has been called, at very short notice, for Tuesday 19 July. The NUS, UCU London Region and other organisations are coordinating an emergency protest in Parliament Square, expected to start at noon. We will publish more information on this page as it becomes available. The decision to rush this Bill through its Parliamentary stages is despite the current political turmoil created by Brexit, and the economic uncertainty facing the HE sector as a whole. Our analysis is that the HE Bill will compound, rather than solve, the Brexit problems facing universities. The Bill does not have sectoral support. Between November and March, some 650 institutions, including universities, royal societies, trades bodies and unions, including the UCU, responded to the Green Paper. Those responses were detailed and frequently contained highly-principled objections. The vast majority challenged the premises of the Green Paper. (Exceptions appear to have been limited to bodies such as lobbyists for the for-profit sector, who have a vested interest in the outcome.) 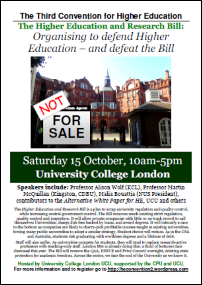 These objections were ignored in the construction of the White Paper and the HE Bill. Johnson and BIS have not responded to the objections made. 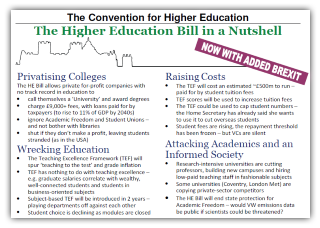 The HE Bill contains a number of components which are actively disruptive to HEIs’ financial positions. Perhaps most importantly, these include permitting ‘challenger’ institutions, often with no record of providing higher education courses of comparable quality to UK universities, to compete for significant numbers of students while allowing them to cherry-pick profitable courses (the ‘monoversity’), or to provide no services, from libraries to student unions, that universities conventionally provide for students. That is, the Bill permits competition, not on equal terms with existing universities, but on substantially reduced terms. In this context, quality assurance mechanisms must be reviewed. The Public Accounts Committee 2014 report into the growth and regulation of these “alternative providers” (documented in the Alternative White Paper) should be quoted at length to MPs. The Bill also would enact a series of significant constitutional reforms changing the relationship between University and the State, in particular in relation to governance, institutional autonomy and the protection of academic freedom. These would have the effect of allowing existing universities to apply to become fully corporate bodies, which, subject to commercial pressures of competition, would prioritise profitable research at the expense of less profitable avenues (minimising charitable research income such as Cancer Research UK funding with low overhead rates), or shut down research completely (as LMU is doing). This must inexorably undermine innovative UK Science and public trust in science. There is a reason why UK universities were set up at arms-length from the State. In their haste to change the regulatory machinery, BIS appears to have ‘forgotten’ what those reasons were. the fact that the Welsh Assembly funds English university places for students from Wales but would be unable to address the poor quality of education offered by English for-profit universities. The EU Referendum outcome complicates the position further. The HE sector is currently in a state of great uncertainty. EU student recruitment is under question (currently 6% of all students in the UK), both at the level of fee (EU vs. International), and the availability of UK-backed student loans to such students (non-UK resident EU students are entitled to some, but not all, UK student loans). Six percent may appear marginal, but institutions go bankrupt on margins. Uncertainties around the availability of EU research funding, which is the largest single source outside of RCUK. Changes to RCUK governance proposed in the Research section of the HE Bill need to be reconsidered in this light. The position of EU/EEA citizens in our universities, staff and students. Broader issues of financial uncertainty, including interest and exchange rates. It would be logical to press the demand that, given the uncertainty generated by Brexit, the Government cannot be permitted to push the Higher Education and Research Bill 2016 through precipitately. The absolute minimum requirement prior to reconvening any public debate over the HE Bill would be a further round of public consultation with HEIs and other stakeholders over a Brexit impact analysis on the sector and the Bill. This entry was posted in event, HE BIll and tagged "second reading", brexit, devolution, he, higher education, lobby, mp, privatisation, protest, research, TEF, university. Bookmark the permalink.